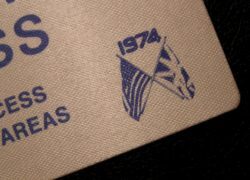 Item description: A scarce Crew Pass for the 1974 USA Tour. Satin pass screen printed blue on white, typical brown crack & split back. Condition report: Excellent condition. Backing still intact. Background to the Elton John 1974 Tour: In January, 1974, Elton John and his band went to Colorado to record the Caribou album. On 1st February Elton John’s 1974 World Tour started in Tokyo, Japan. On 5th May, Elton played a benefit concert at his beloved Watford Football Stadium, where he was joined by Nazareth and Rod Stewart, and on 18th May he performed a special benefit concert for the Invalid Children’s Aid Society at London’s Royal Festival Hall, portions of which would become the ‘Here’ part of his 1976 live album, ‘Here And There’. The tour’s opening act was The Kiki Dee Band, riding the success of Kiki’s hit single, ‘I’ve Got The Music In Me’, and joining Elton during the latter-half of his set were the Muscle Shoals Horns. By any measure, the biggest show of the year was on Thanksgiving evening, when John Lennon joined “Elton and the boys” on stage for three songs at New York’s Madison Square Garden: ‘Whatever Gets You Thru The Night’, ‘Lucy In The Sky With Diamonds’, and ‘I Saw Her Standing There’. What wound up being the former Beatle’s last concert performance, and a career highlight for everyone in the band, was included on the 1995 re-issue of the Here And There CD. The 1974 tour ended at Christmas time with five concerts at the Hammersmith Odeon, with Rod Stewart and Gary Giltter joining Elton and the band on stage while they played ‘White Christmas’ as fake snow fell from the rafters. These were to be the final performances of the decade for Nigel Olsson and Dee Murray; Elton chose to adjust his band line-up in early 1975. 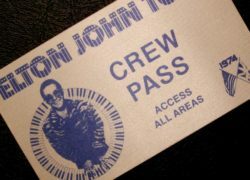 Special notes: This pass was used by crew members during the US leg of the tour. For obvious reasons, Crew Passes are far rarer than Back Stage Passes. 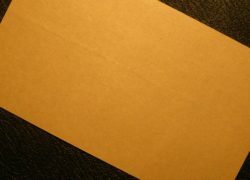 Provenance: Ex-Andy Moore archive. Roadie / Guitar Technician. On tour with Elton John during the 1970s, along with various other bands such as The Who, Thin Lizzy etc.